﻿﻿﻿﻿﻿﻿﻿﻿The extraordinary cuisine of Brazil is an amalgam of the cooking heritage of three disparate groups of people: the native Indians, the conquering Portuguese and the African slaves the latter brought to work in the sugarcane fields. Every bit of the country’s food bespeaks its distinct culinary history. The native Indians mainly subsisted on corn porridge, cassava meal, sweet potatoes, hearts of palm and many species of game and fish. In 1533, the Portuguese colonized Brazil, bringing with them a variety of North African imports such as dried fruits and pastries that were inspired by a lengthy Moorish occupation. It was the African cooks in the colonial kitchens of the sugarcane barons, however, who provided the strongest influence in generating what is now considered Brazilian cuisine. Their contributions, which included dende pepper and coconut milk, staples of West African cooking, left a permanent stamp on the Brazilian palate. Within the state of Bahia, for instance, the predominant cuisine is Afro-Bahian, which evolved from plantation cooks improvising on African, Indian and traditional Portuguese dishes using locally available ingredients. 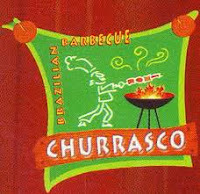 Churrasco is Brazil’s version of the barbecue. Fresh meat, ranging from beef to chicken and pork, is grilled to perfection over a wood-fired grill. 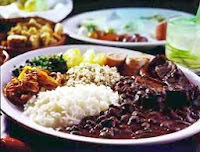 Churrascarias are among the preferred restaurants of Brazilians and can be found around every corner. Most of them offer buffet-style service, so guests can eat as much as they like, tasting several kinds of meat. No visit to Brazil would be complete without dining at one of these establishments. Waiters, equipped with what is called a rodizio circle the restaurant with long skewers of perfectly flame grilled meats, which they cut into wafer thin slices at your table. You’ll be given a small card, green on one side and red on the other. If you display the green side, you’re telling them that you want service to be non-stop. To take a break - just flip the card to the red side. Feijoada, considered by most to be the national dish of Brazil, is basically a black bean stew with a variety of meats and sausages added to it. Traditional side dishes include rice, farofa, onions, kale and orange slices. A common side dish in Brazil, farofa is basically cassava flour toasted with butter or bacon grease. Various ingredients can be added or it can be used a stuffing. ﻿A favorite in the state of Minas Gerais, couve e mineira, is a tasty blend of kale and garlic sautéed in olive oil. Introduced by the Portuguese, bacalhau (salted cold) finds its way into appetizers, soups, main courses and savory puddings throughout Brazil. It is often served with another Portuguese-inspired favorite, bolinos de arroz, which is made of rice, parsley and onions formed into balls, dipped in egg batter and fried. Guaranteed to give you a "kick"
Coffee is a highly appreciated beverage in nearly all parts of the world, yet nowhere is it such an important part of everyday living as in Brazil. 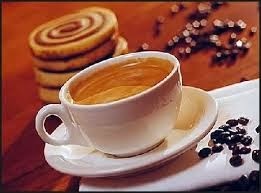 The drink, called cafezinho, is served in demitasse cups at frequent intervals throughout the day. It is not unusual for a Brazilian to consume anywhere from 12 to 24 of these little demitasses per day. While you're there, don't leave without sampling an authentic caipirinha. Many Brazilians think of this drank as the national beverage. The refreshing, and sometimes strong, beverage can cool anyone down on the hottest of days. 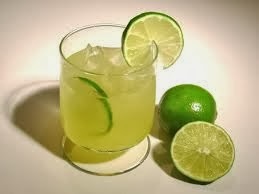 It consists of crushed lime slices and sugar added to liquor called cachaça and it is served over crushed ice. If you're a margarita lover, you might abandon that cocktail after a taste of this one. 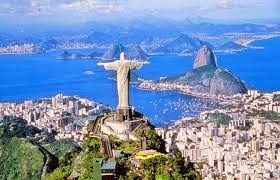 Your post has whet my appetite for a visit to Brazil! We love churrasco! One or two dozen power shots of coffee as is their habit would have me dancing all day!